Welcome to Moonglow Technologies, the home of cutting edge astronomical products. Please browse our site using the buttons above. New software release: Eclipse Orchestrator 3.7 released June 15, 2017! Watch the Eclipse, Not Your Camera! Scripted control of your cameras and more from your laptop. Perfect for situations where photos must be taken on time, every time. Includes eclipse circumstance calculations and GPS support! Click here for more information. Interference in your Hydrogen Alpha solar images? 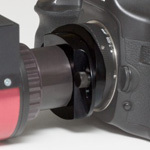 The Interference Eliminator screws in front of your camera and can reduce or eliminate the problem. Click here for more information.